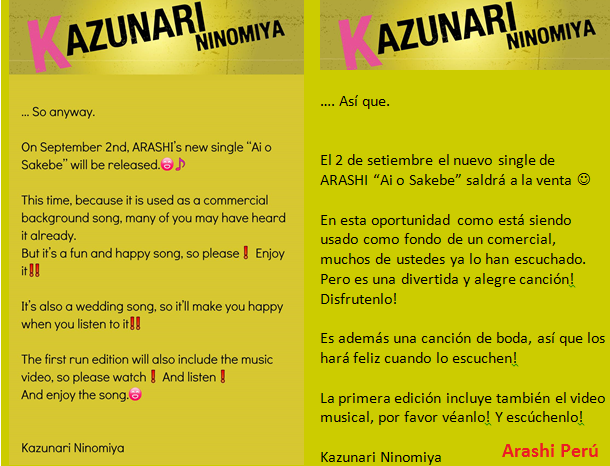 [TRADUCCIÓN] MENSAJES DE ARASHI CON REFERENCIA A SU NUEVO SINGLE AI WO SAKEBE / J-MESSAGES OF ARASHI REGARDING THEIR NEW SINGLE AI WO SAKEBE ~ . 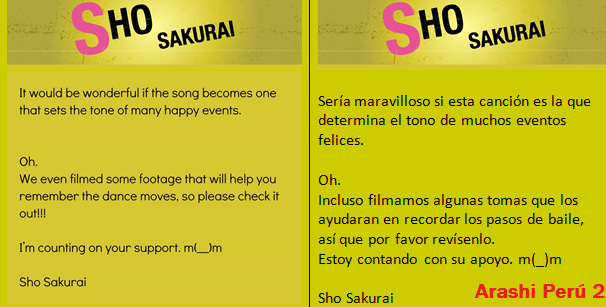 Arashi lanzó durante los 5 primeros días antes del lanzamiento oficial de su nuevo single Ai wo Sakebe distintos mensajes relacionados a su nuevo single. 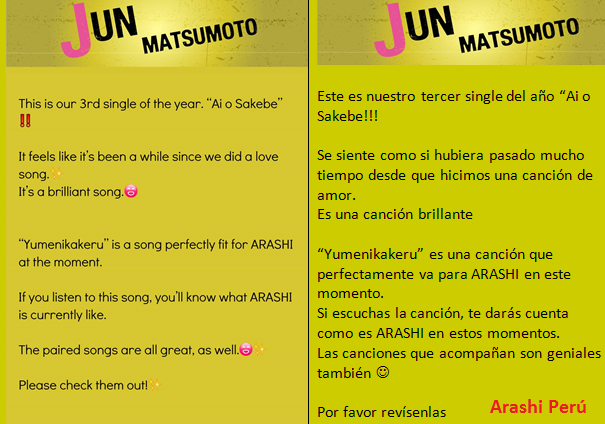 El primero en mandar el mensaje fue Jun, seguido por Nino, Aiba, Ohno y finalizando con Sho. Estuvieron muy divertidos sus comentarios como siempre. 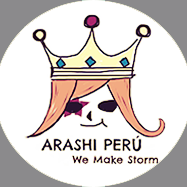 La fuente original es la página de ARashi en su aplicación celular y la traducción al español es por Arashi Perú. 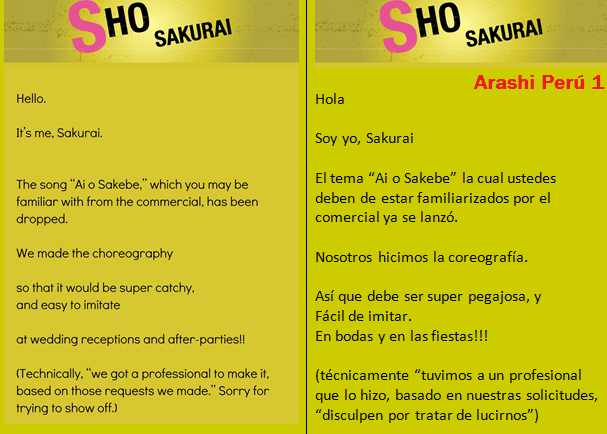 Arashi for 5 days before the release of their new single Ai Wo Sakebe sent out message through their application for mobiles. The first one to send the message was Jun followed by Nino, Aiba, Ohno and finishing with Sho. They have so funny comments as usual. 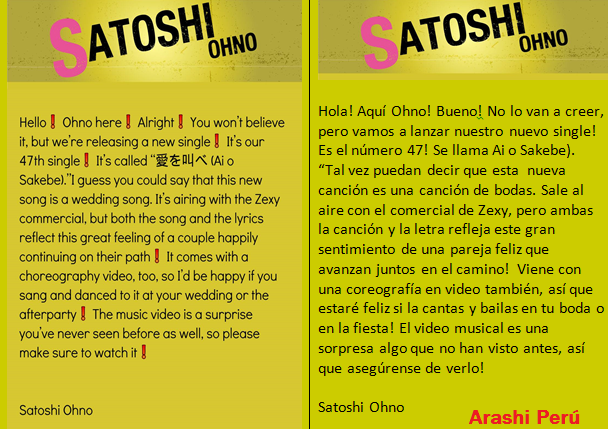 The source in English is by Johnnys web and the translation in Spanish is by Arashi Peru.